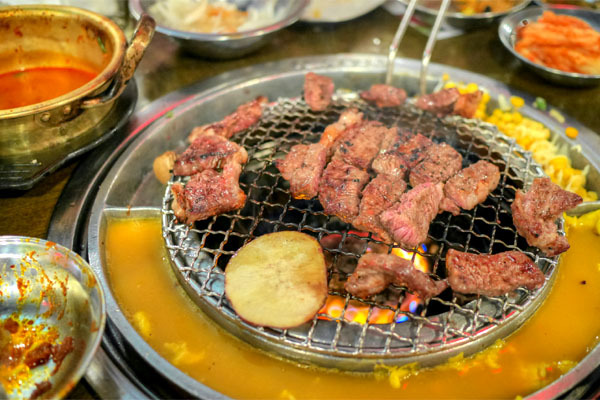 I believe that this is the first time I've reported on a Korean barbeque place in LA, so it makes sense to start at one of the best. 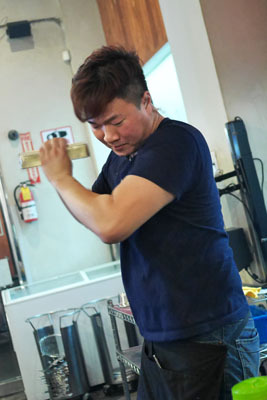 This eponymous restaurant is the work of ssireum wrestler-turned-entertainer Kang Ho-dong, who operates dozens of these places across Korea, both under the KHB moniker and the slightly lower-end "678." 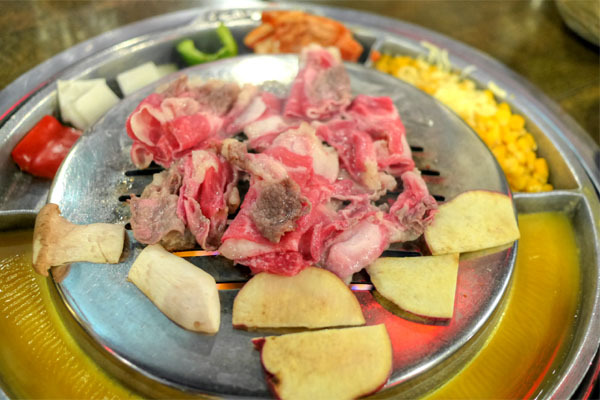 The LA outpost debuted at the start of 2012, and joins Baekjeongs in nearby Buena Park and Flushing, New York. 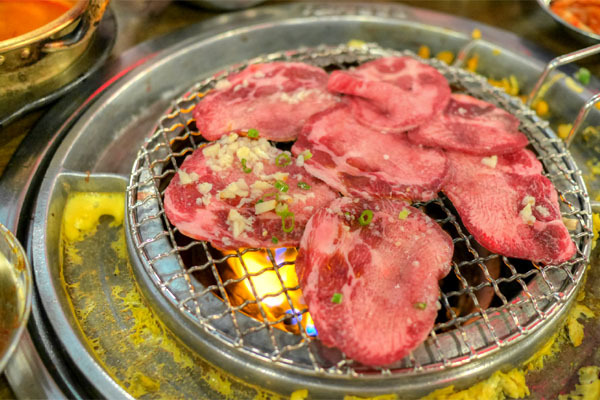 Meanwhile, there are 678s in Honolulu, Atlanta, Sydney, Manila, and Guangzhou, as well as Ahgassi Gopchang, another KBBQ place right here in Koreatown. 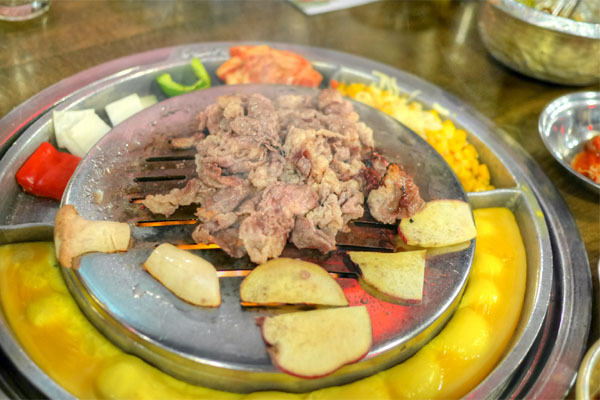 Baekjeong occupies a storefront right in the center of Chapman Market, a large, bustling, somewhat smoky space overarched by a maze of air vents. We missed the cardboard cutouts of Mr. Kang, though. 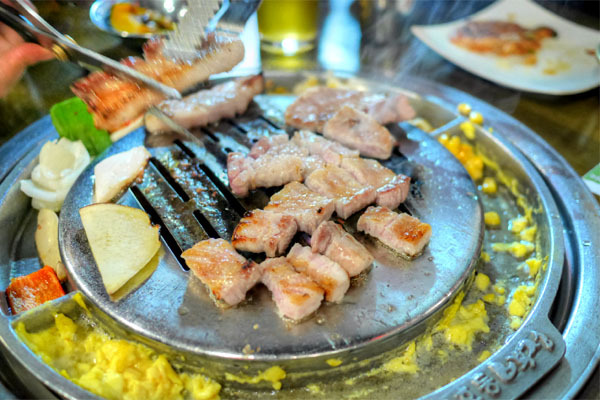 Kang Hodong Baekjeong's menu is small, perhaps the smallest I've encountered at a KBBQ joint. I appreciate the focus though. The drink list, meanwhile, is expectedly underwhelming, so naturally we brought our own beer (corkage was negotiated to $7 a bottle). Click for larger versions. 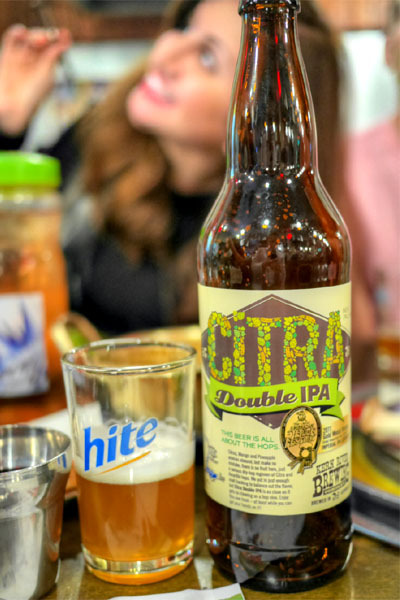 I started with the 2014 Kern River Citra Double IPA, probably one of the most hyped IPAs ever (limited production, sold only at the brewery, through a lottery). I'm not sure if it's quite worth the hubbub surrounding it, but it was indeed tasty, with a floral, tropical nose of grapefruit that continued on to the palate, where it was joined by a countervailing hop bitterness and just the slightest undercurrent of malt. 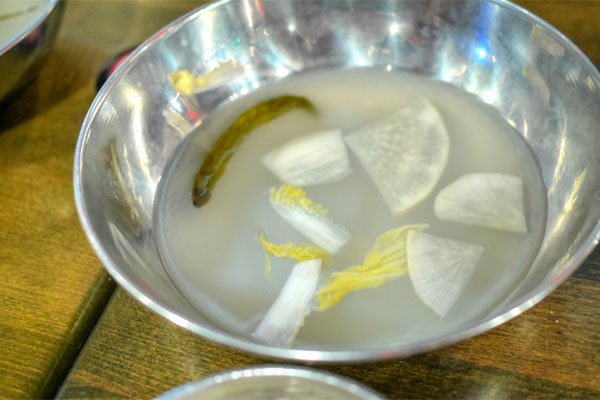 Baekjeong doesn't do a massive number of banchan, but what they do provide is solid. 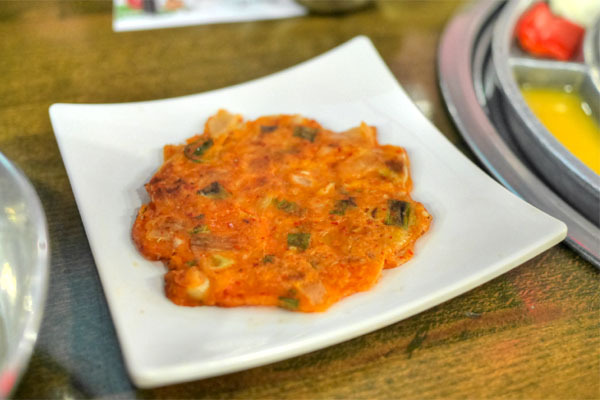 The kimchijeon was an early standout with its in-your-face funky, spicy flavors. 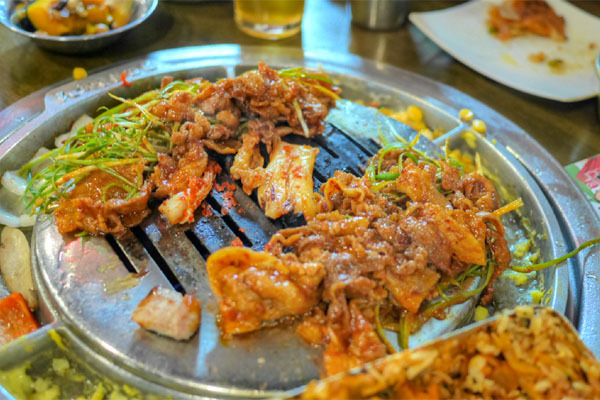 Mul kimchi, meanwhile, was light, tangy, and a refreshing kick in the pants. 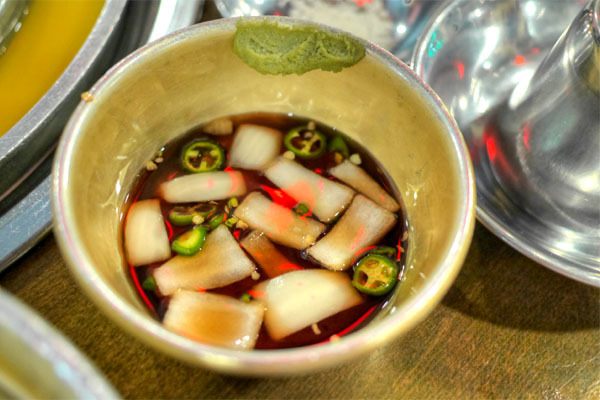 Crunchy kongnamul came with a topping of spicy gochujang. The Logsdon Fresh Hop Seizoen was another winner, really floral and fruity smelling, while taste-wise, you got more of the same, joined by a pleasant amount of spice, bitterness, and yeasty saison notes. 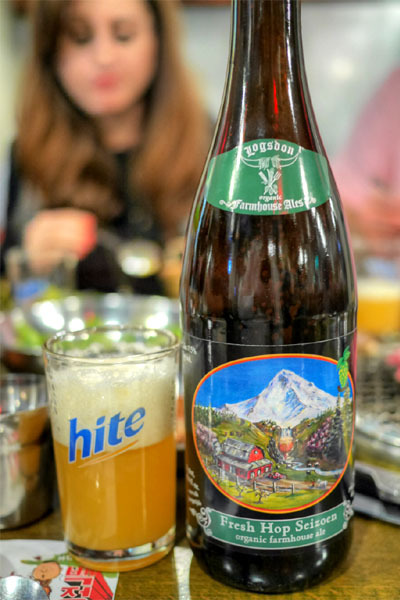 Delicious and easy-drinking. 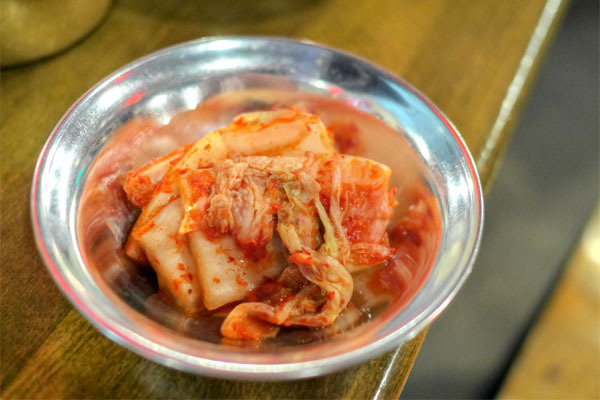 The requisite baechu kimchi was on point, and probably a bit funkier than the stuff one typically finds. 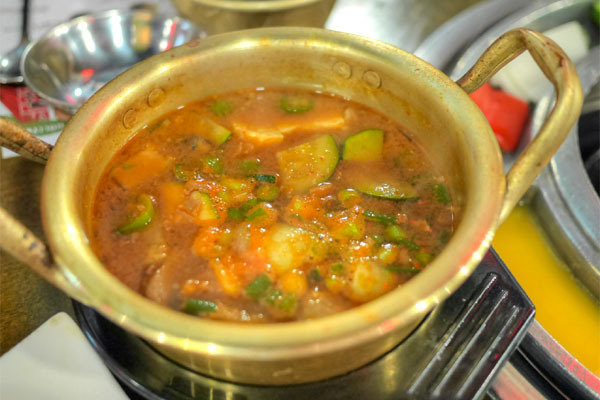 Danhobak, a.k.a. 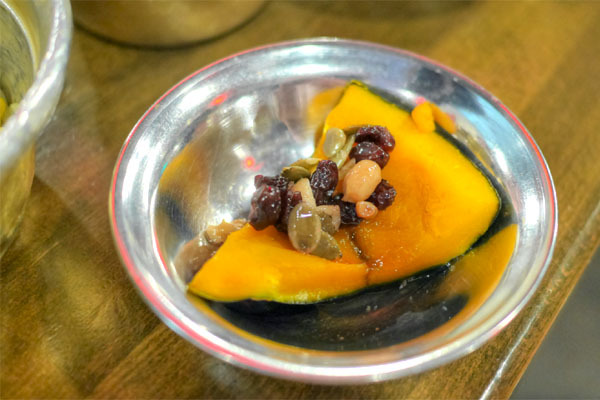 kabocha squash, arrived topped with syrup, raisins, and nuts, making for an almost dessert-like experience. Next, I popped the 2013 Perennial Hereafter, a Belgian golden with white sage and pears, brewed in collaboration with Penrose Brewing Company. I really enjoyed this one as well, with its great sage aromatics and tasty interplay of fruity pear, herb, and spice on the tongue, all underscored by a tinge of bitterness and yeast. 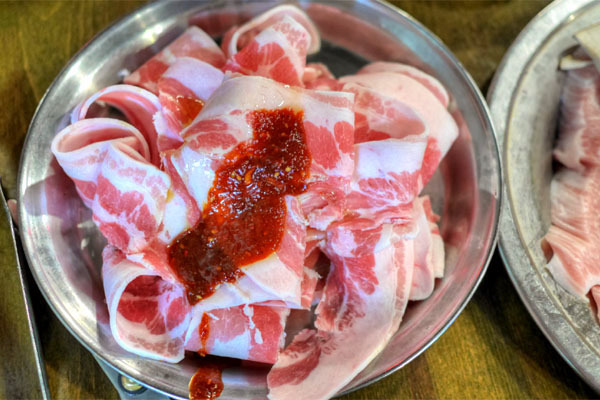 You get a special wasabi-enhanced, soy- and rice wine-based house dipping sauce with onion and jalapeno, a sweet-savory concoction that paired swimmingly with the meats. 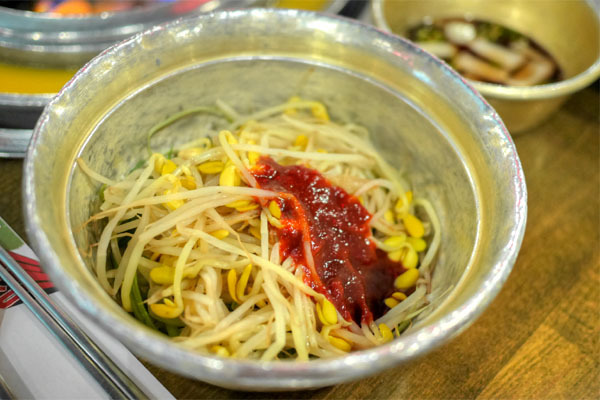 There was also the standard salt-sesame oil combo on the side, too. 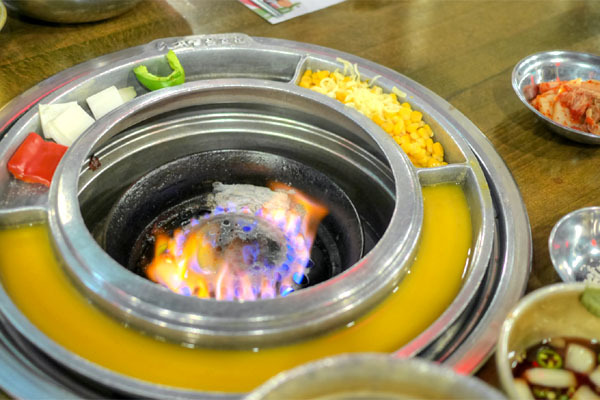 The gas- and charcoal-fired grill setup was unique as well, with trenches sectioned off for corn-cheese, egg custard, and veggies. 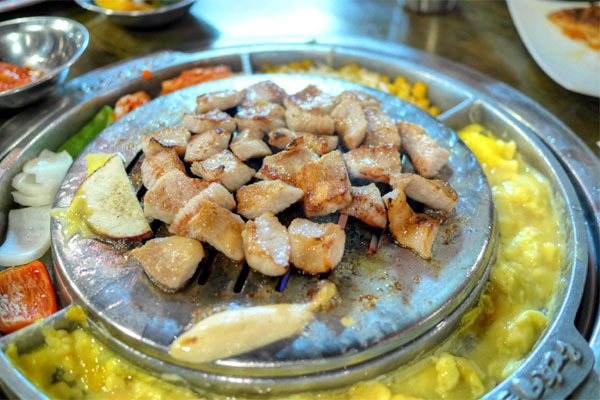 Note, also, that unlike at most KBBQ places, the cooking of the various meats is actually done for you by the staff. 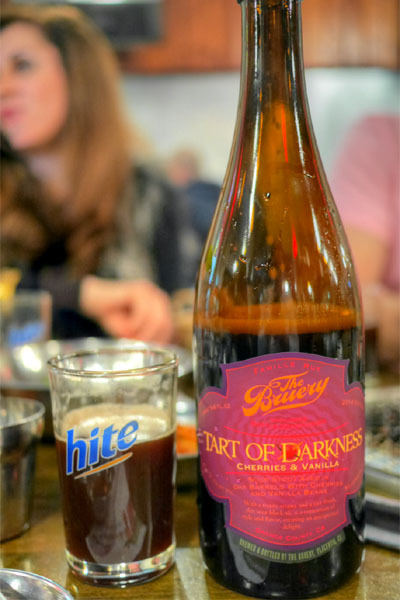 Another beer highlight for me was the 2014 The Bruery Tart of Darkness with Cherries & Vanilla, a sour stout aged on oak. I got a strong bouquet of cherry intermingled with malt, which led to more fruit and a suanmei-esque tartness on the palate. This was balanced by the dark, roasty, characteristics from the stout, while the vanilla added just a whisper of sweetness to it all. 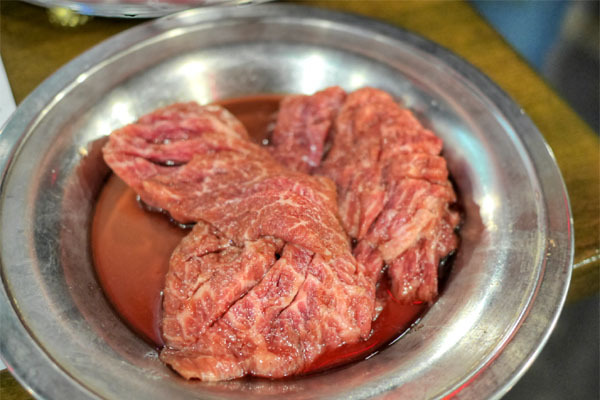 Though it is possible to order à la carte here, the standard unit of consumption seems to be one of the meat combos. 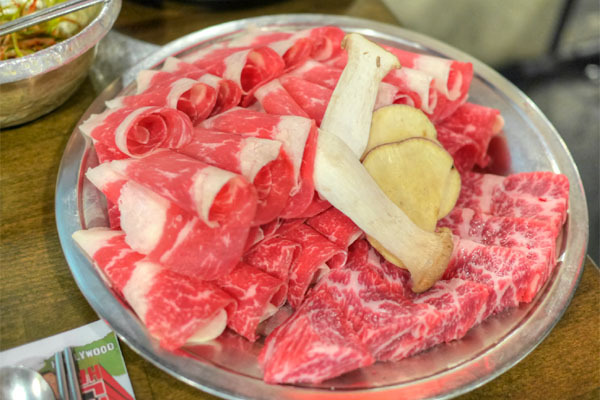 The small beef combo we ordered contained Thinly Sliced Brisket, Marinated Boneless Short Rib, Prime Boneless Short Rib, and a Beef Brisket Soybean Paste Stew. 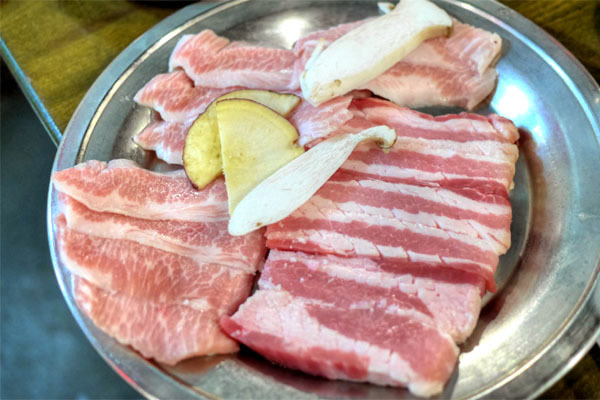 The corresponding pork combo, meanwhile, brought out Premium Seared Pork Belly, Premium Pork Jowl, Thinly Sliced Spicy Pork Belly, and Kimchi Stew. 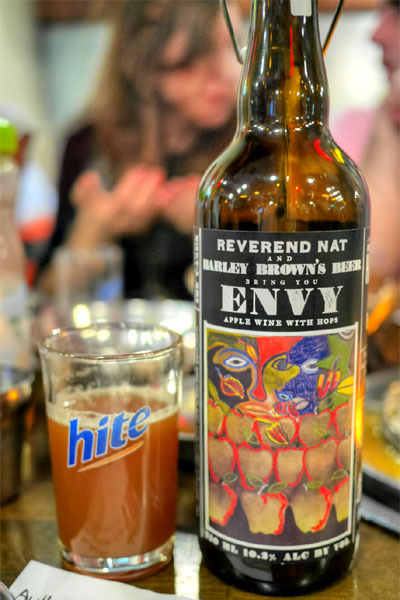 Our sole cider was the Reverend Nat's Envy, a collabo with Barley Brown's Brew Pub. I really liked this one, with its sweet, spicy, almost autumnal qualities commingled with a musty, funky character that lent a pleasing complexity. We commenced with the ubiquitous chadol bagi, which had a nice mix of tender and crispy bits along with a delightful smoky flair. Hang jun sal was spot on, slightly chewy and sponge-y to the bite, and brimming with porky goodness, fat, and char. 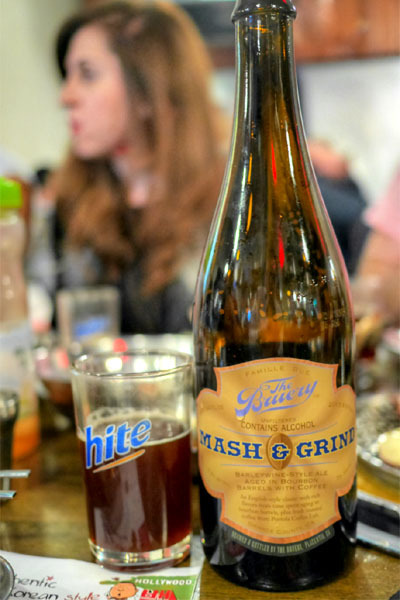 The 2013 The Bruery Mash & Grind was an English barleywine with Portola coffee, aged in bourbon barrels. This one was smooth, with a malty, caramel-esque, bourbon-y character cut by omnipresent overtones of bitter coffee. 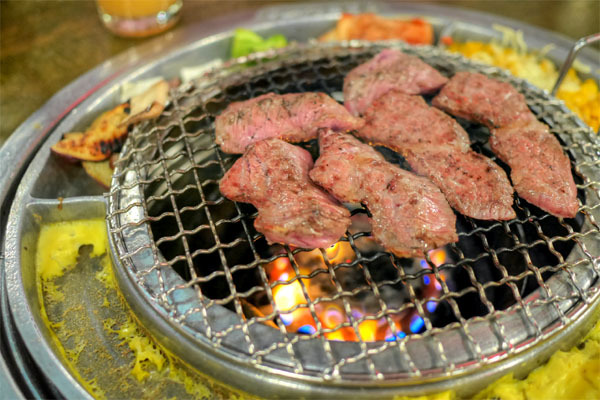 The kkot sal definitely delivered, a beautiful cut of meat that cooked up tender and juicy, with a delicate beefy flavor. The meat combos come with your choices of stew, so naturally we had one of each. 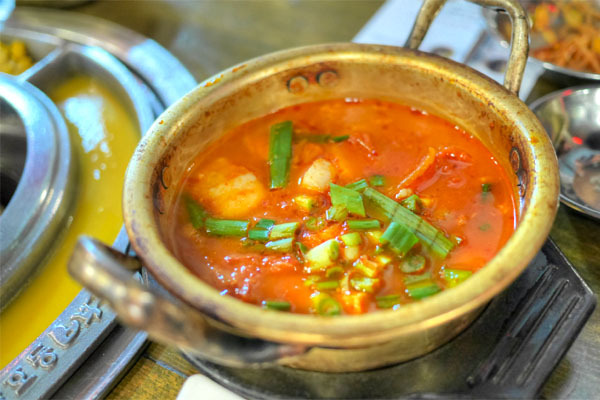 The doenjang jjigae arrived hearty and satisfying, with a comforting depth to it, while the kimchi jjigae was more in-your-face, really showing off the potency of the pickle. 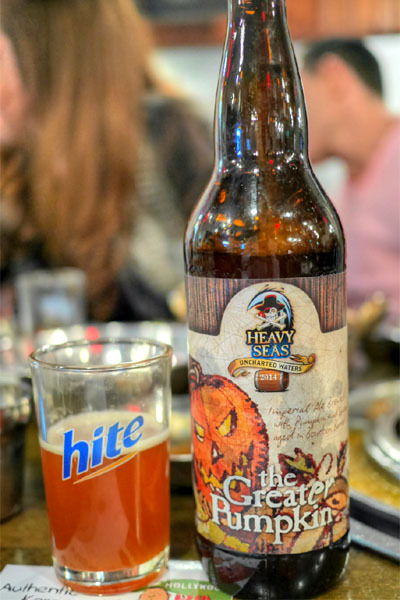 Moving on, the next beer was the 2014 Heavy Seas The Greater Pumpkin. An ale brewed with pumpkin and spices and aged in bourbon barrels, this one was smooth and appropriately autumnal, with its notes of sweet-spice linger long, playing well off of the malt, vanilla, and oak present. 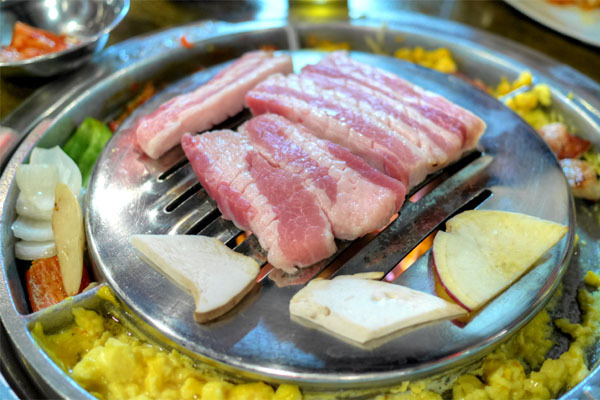 Samgyeopsal is always a must-get for me, and the version here didn't disappoint, a particularly porcine prep with a good balance of lean, fat, and char. 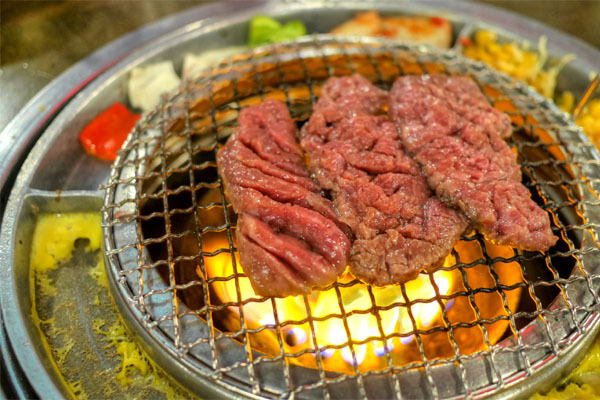 I appreciated the thicker cut on the meat, too, which made for a more satisfying eating experience. 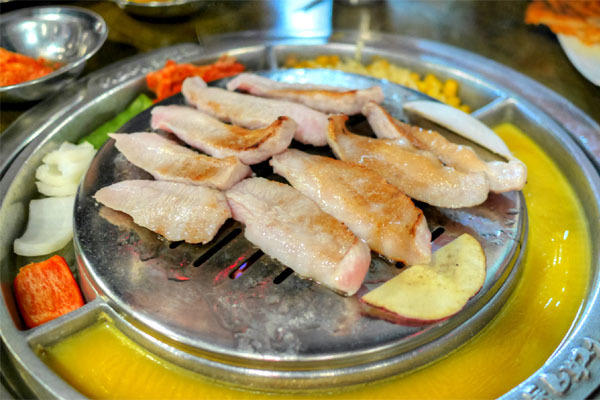 You can't go wrong with the jumulleok either, an especially tender cut with a tasty mix of savory and sweet flavors. 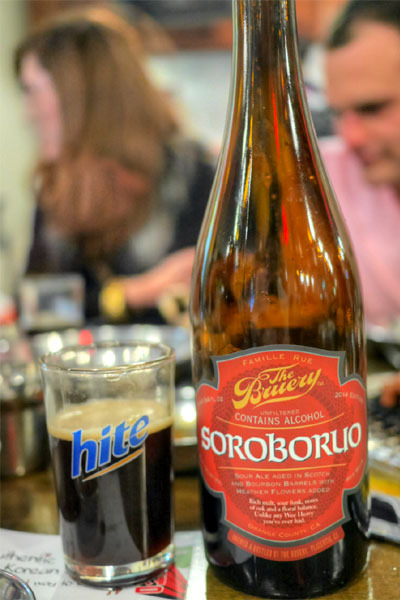 I'd never had anything quite like the 2014 The Bruery Soroboruo before. It was a sour Scotch ale, aged in bourbon barrels, with heather flowers added. I liked it better than I thought I would though, with the beer's base of dark, rich, malty, oaky flavors balanced by a tart bit of funk, the heather adding a lovely floral quality toward the finish. 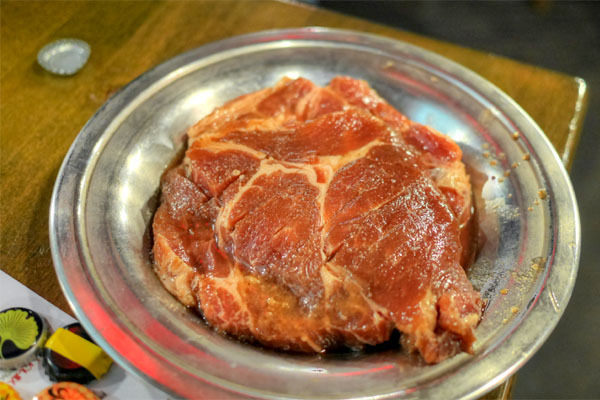 The final meat from our combos was the most heavy-handed, as the spice and heat in the dish tended to overwhelm the natural goodness of the pork. That being said, I certainly didn't mind eating it. Note, also, that this was the only meat that was cooked in the kitchen and merely finished on our grill. 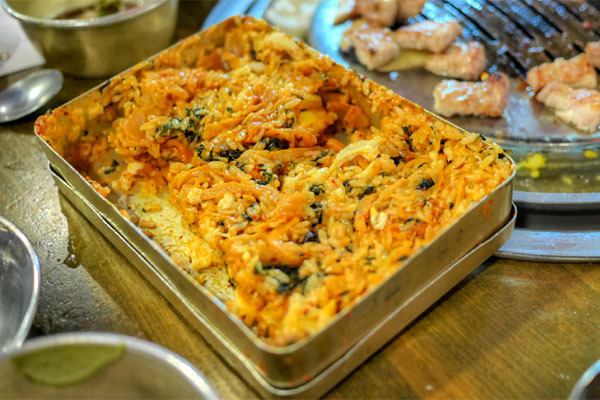 The most intriguing dish of the night was the dosirak, presented as a child's lunchbox filled with rice, egg, seaweed, veggies, and kimchi. 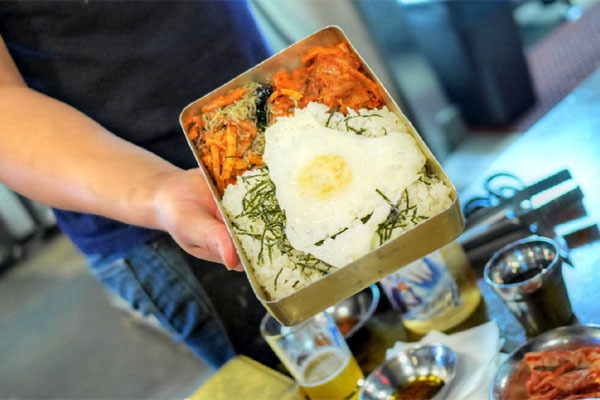 The box is then shaken violently by a server--Devon Espinosa would be proud--and presented as a sort of a bibimbap. It's as tasty as you'd expect, with a good amount of heat and a umami-rich kick from the nori that really binds it all together. 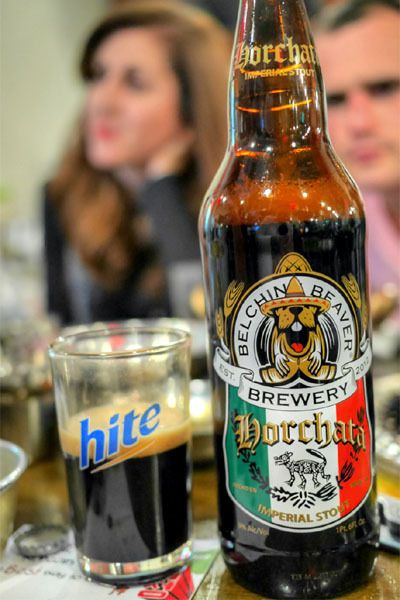 At this point, we got into the more "desserty" beers, starting with the 2014 Belching Beaver Horchata Imperial Stout. A new release created for the brewery's second anniversary, this one was pretty tasty, though not all that horchata-esque. 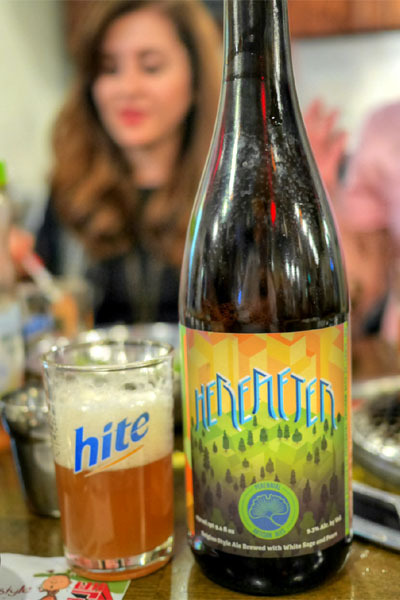 Rather, it conveyed a cinnamon-y sort of spice, along with notes of coffee and chocolate, making for a smooth, drinkable beer. 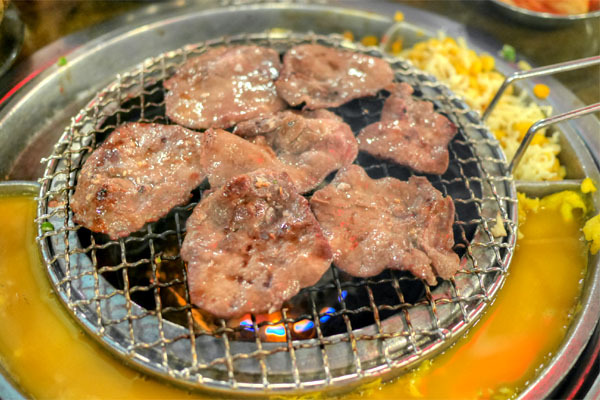 Tongue is one of my favs for KBBQ purposes, and here the hyeo shined, coming out well-textured and dripping with bovine goodness. Even better when taken with a bite of the included onions. 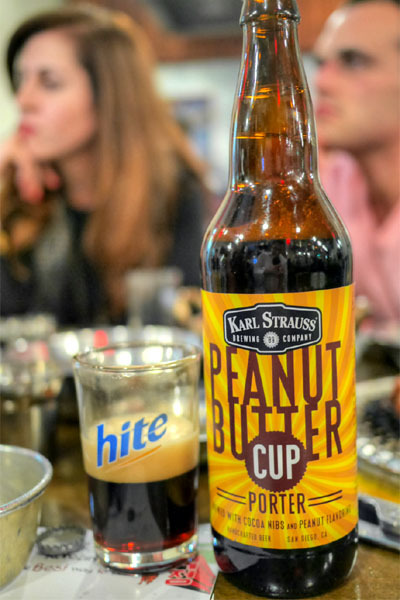 Sticking with something sweet, we had here the Karl Strauss Peanut Butter Cup Porter. I wasn't a huge fan of this, finding the peanut butter character on the weak side. In this style, I'd much prefer to drink the Peanut Butter Milk Stout from Belching Beaver. Deungsim came out looking rather impressive, and wasn't bad to eat, either. 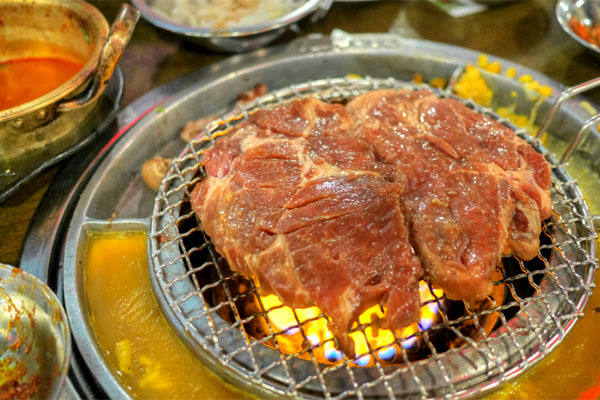 It was certainly the most steak-like of the meats, and ate surprisingly tender, with a pure beefy relish that paired especially well with a dab of sesame oil. 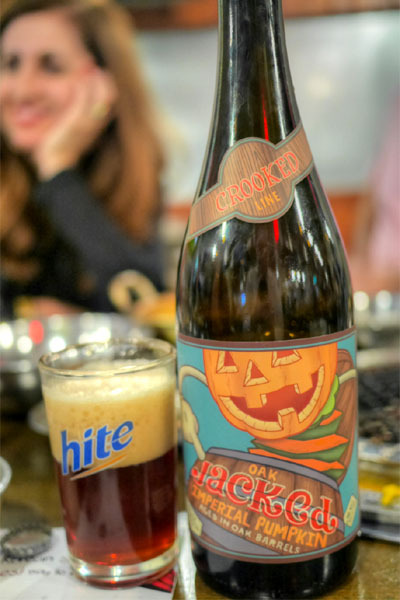 Our final beer was also of the pumpkin type, the Uinta Oak Jacked Imperial Pumpkin Ale, brewed with spices and aged in oak. Lots of malty, caramel-y sweetness on this one, along with plenty of spicy notes and a hint of oaky vanilla, though I wanted to taste more actual pumpkin. 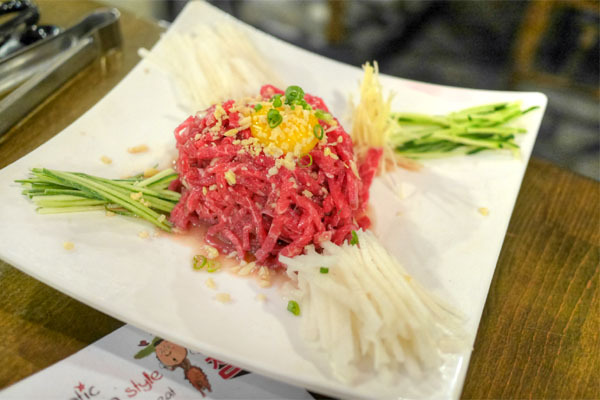 We also made sure to try Beakjeong's yukhoe, basically a Korean beef tartar topped with raw egg and accompanied by julienned bae pear and cucumber. 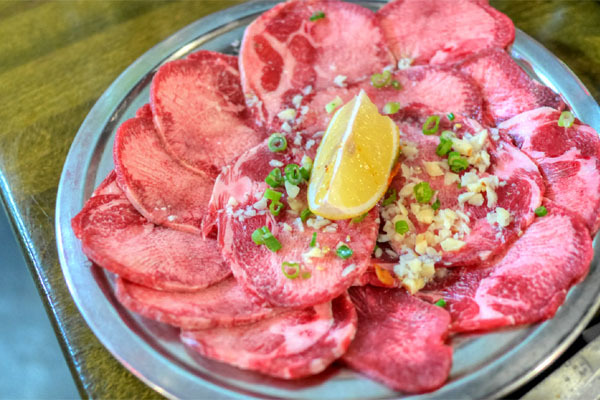 The raw beef was the star here, its soy-enhanced flavors smartly set off by the sweetness of the fruit and the zesty ginger. 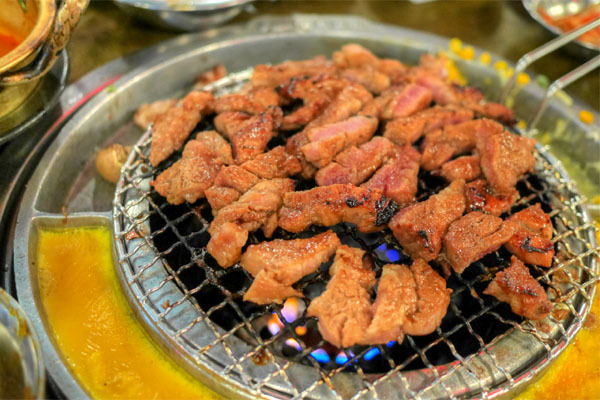 Last up was the marinated pork collar, which arrived wonderfully textured, and brimming with a commixture of sweet and piggy savors. A fitting conclusion to a memorable meal. 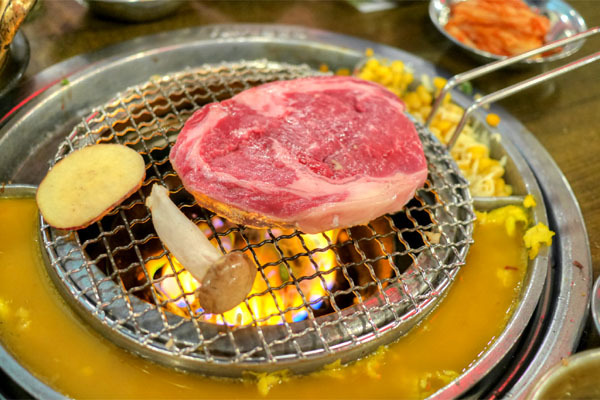 Kang Hodong managed to live up to expectations, delivering a great meal that stands as arguably the top Korean barbeque experience I've had here in LA. The meat selection, though limited, was top notch; you could taste the quality, as clichéd as that sounds. 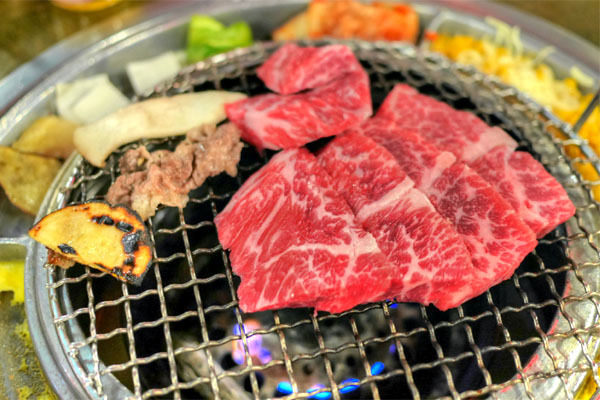 Service, meanwhile, went as well as you could expect, and the atmosphere was thoroughly convivial, which is, of course, part of the fun of KBBQ. It's no wonder that this place is constantly busy. Loving the beer reviews. Keep up the great work Kevin. wow, my friend's mom owns this place! You really need to start bringing proper glassware for your beer or else ask for a wine glass at the restaurants. Pouring some of these on those glasses is not doing the beer justice. 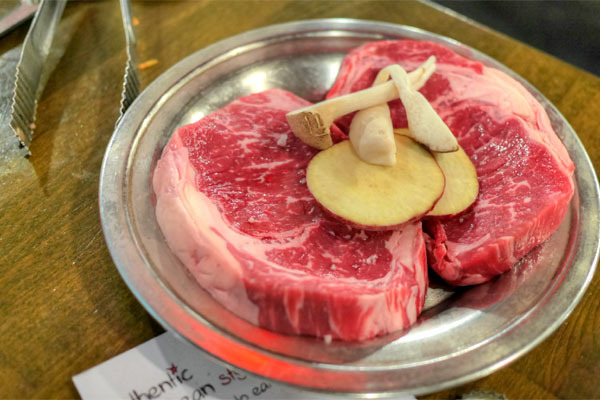 Kevin, did you ever get to try the Piedmontese Tomahawk at Star King before they closed? It was a mighty delicious cut of beef.